As we watch the crisis continue to unfold this week in east Texas, we want to contribute our support to the disaster relief operations underway there. This Friday, the Lower and Upper Schools will host a dress-down fundraiser. We ask that each student bring in a suggested donation of $3 or more to their homeroom, and they will be allowed to dress down for the day. It is a small way we can support our brothers and sisters in Houston and the surrounding area. All proceeds from the fundraiser will be directed to the hurricane relief efforts of Catholic Charities. • Nearly half of all backorders that were in our system as of August 10th have been filled and shipped. • Most items are now in stock, and we are continuing to fill thousands of orders daily. • A few items are out-of-stock and in production, which means some orders may not ship until mid-September. • We are updating all customers as to the status of their orders and also letting them know that any outstanding items can be substituted for another item(s) at the Parker or Charter store that serves your school. Impacted customers also have the option of cancelling any order for a full refund at any time. • We have expanded our call center staff to significantly decrease wait times for families to talk with customer service representatives. Just now, I received notice that Parker is experiencing additional delays: their corporate office, warehouse, and customer service are all located in the Houston area and have been impacted by the storm. This year, the dads of our community are renewing efforts to create more opportunities for fellowship among the fathers in our school. There are several opportunities coming up this September for the dads of HSP to get together, sponsored by our exceptional Dad's Club here at HSP, led by HSP dad Jason Neff. On September 6, there's a get-together for dads at Local 3, from 4:30pm-6:30pm, a chance to talk to other HSP dads. You can help us plan for food by RSVPing here. A group of HSP dads are getting together for the Braves-Nationals game on Wednesday, September 20. You can learn more and pitch in $20 for the ticket block here. I also highly encourage our dads to join us every other Friday at 7:30am at the Lower School for a dad's Bible study, led by Jason Neff. You can learn more about that here. With all of these events for HSP dads, I would be remiss not to mention the Mother's Coffee, hosted by Connections on September 22. 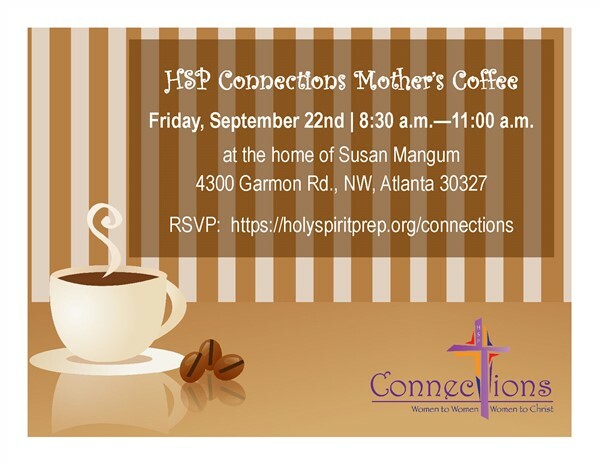 The moms of HSP will get together this morning at the Mangum home. You can learn more about the Coffee and about Connections here. Finally, Steve Rummelsburg has been an asset to our Upper School's theology department since he and his family relocated across the country three years ago to join our community. We are proud to name him as our Writer-in-Residence this school year as he takes a sabbatical from teaching to complete his book, The Crisis of Faith and Reason in the Catholic School. You may know that Steve is a prolific contributor to publications and online journals like Integrated Catholic Life, Crisis, Catholic Exchange, and The Imaginative Conservative. He has also authored a number of curriculum guides published by the Sophia Institute Press, on whose advisory board he sits. I will be supporting his efforts by prayer as he represents Holy Spirit Prep throughout the country, writing and speaking publicly on matters of faith, culture, and education. Congratulations, Steve! The Lower and Upper School campuses will sponsor a dress-down day fundraiser this Friday, September 1, supporting Catholic Charities' relief efforts in the wake of Hurricane Harvey. Students should bring a suggested donation of $3.00 or more this Friday, to be collected by their homeroom teachers. Students may dress down in standard dress-down wear (as defined by campus handbooks). The Cougar Dads Club is a club for every dad at HSP. It hosts several different events for dads during the school year, including the upcoming events below. If you want to learn more about the Cougar Dads Club, email HSP dad Jason Neff at jneff01@gmail.com, or pop by one of the events below. Meet other Cougar dads and hear about Cougar Dad's Club events for the 2017-2018 school year. Please RSVP by clicking here to help us plan food for the event. Add to your calendar below. Join your fellow Dads for a night out at Suntrust Park and watch the Braves take on the Washington Nationals. Ticket details coming soon; add to your calendar below. HSP celebrates its first of four All-School Masses of the year on Friday, September 15, at 8:15am! This Mass celebrates our 5th graders and new 6th-graders, who will be inducted into the House system in a tying ceremony following Mass. Our school community will gather in Holy Spirit Catholic Church to worship together. Parents are encouraged to attend! The Preschool will start at its normal time this morning. Preschool students are welcome to attend this first All-School Mass of the year with their families! 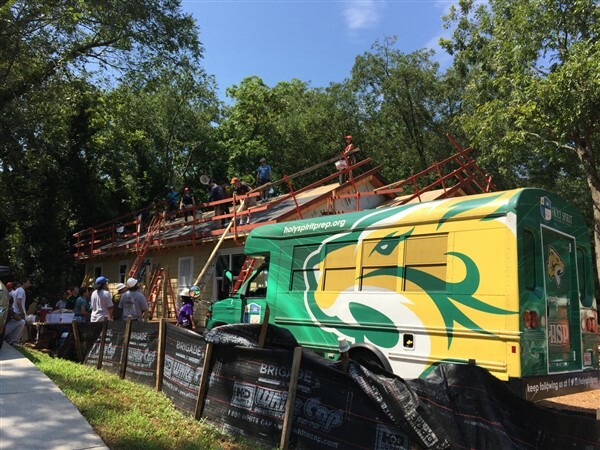 On Saturday, August 19, a team of students, parents, teachers, and administrators assembled at Atlanta Habitat for Humanity's most recent construction site, prepared for a long day of working alongside the family who will ultimately live there. 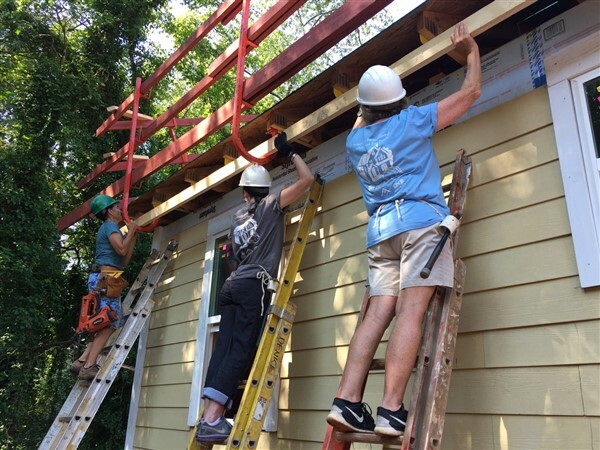 Ignoring the heat, the massive crew worked together into the afternoon on roofing, shingling and siding. Members of the ONE apostolate, an HSP club dedicated to feeding the hungry, provided lunches for the team. 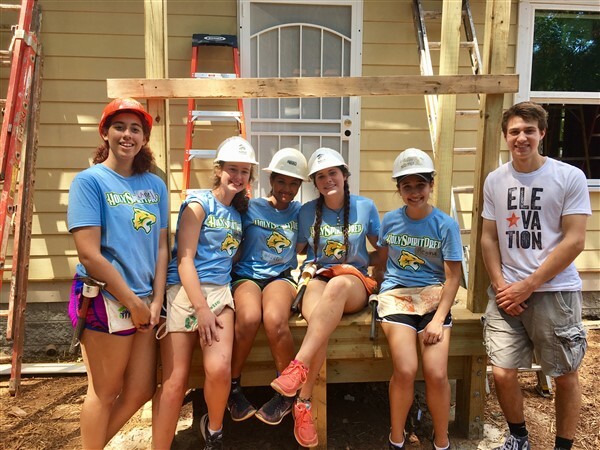 This marks the second year in a row that Holy Spirit Prep has sponsored the Pope Francis Build, an initiative of Habitat for Humanity to bring Catholic institutions from across Atlanta together to sponsor the construction of a new home for a deserving, low-income family. 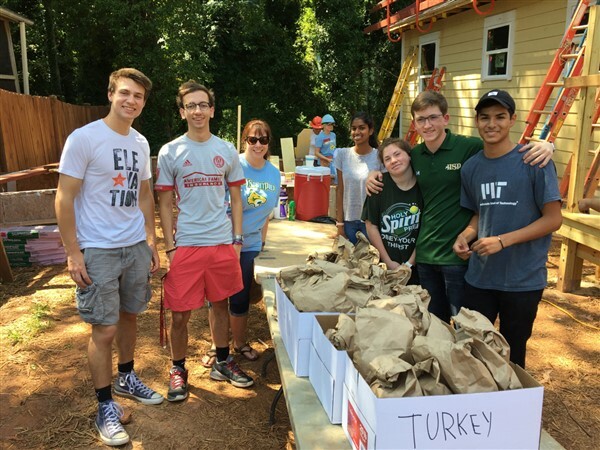 As a sponsor, Holy Spirit Prep provided volunteers and lunches for one of the home's seven build days. The student organizations St. Joseph's Cohort (SJC) and the ONE apostolate took the lead in coordinating these efforts. The Pope Francis build home is one of many homes SJC has worked on. 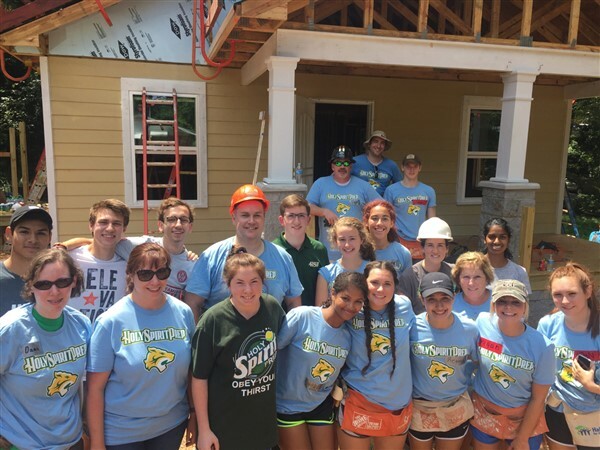 This summer, the group traveled to Whitley City, Kentucky, for the fifth year in a row to work on construction projects for families in need there. 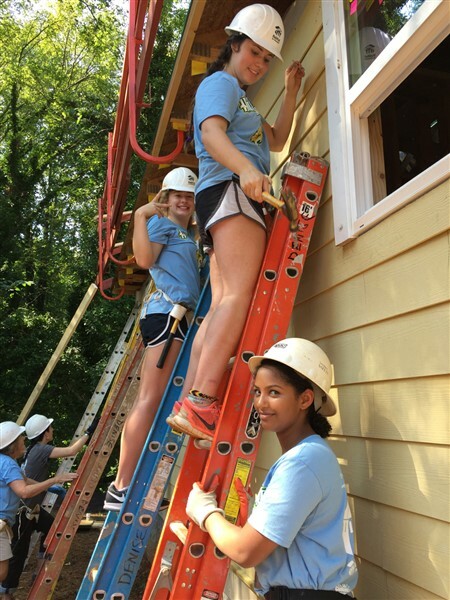 Atlanta Habitat for Humanity, one of more than 1,400 U.S. affiliates of Habitat for Humanity International, is a nonprofit organization dedicated to homeownership for working families. 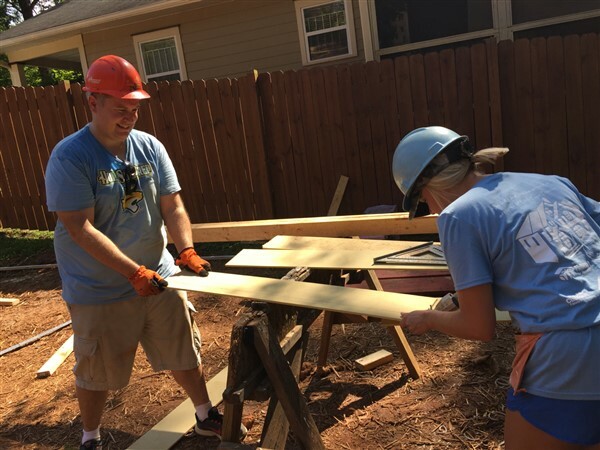 Since 1983, volunteers from corporations and from faith-based and civic organizations have worked in partnership with qualified homebuyers to construct affordable, green, quality homes, which are then purchased through no-interest mortgages. 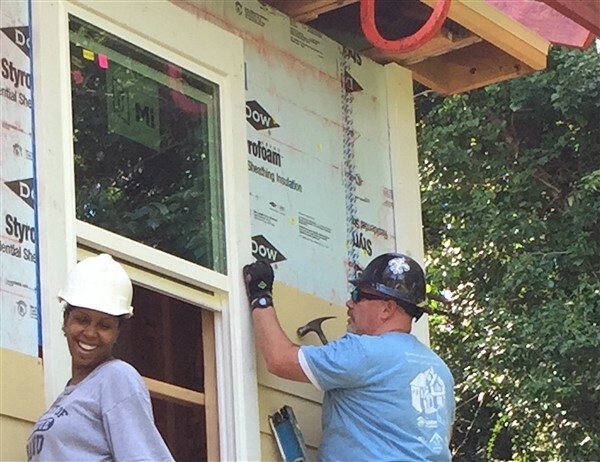 To date, Atlanta Habitat has built and renovated more than 1,370 homes, primarily in the City of Atlanta and South Fulton County. For more information, please visit www.atlantahabitat.org or call 404.223.5180. Steven Jonathan Rummelsburg has been named Writer-in-Residence at Holy Spirit Prep as he pens his book, The Crisis of Faith and Reason in the Catholic School. 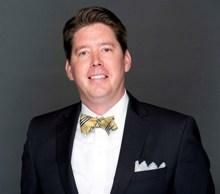 Steven teaches 12th grade philosophy and apologetics at Holy Spirit Prep. He is on the Teacher Advisory Committee at Sophia Institute Press for Teachers and has co-authored 4 Catholic curriculum guides being used nationwide. 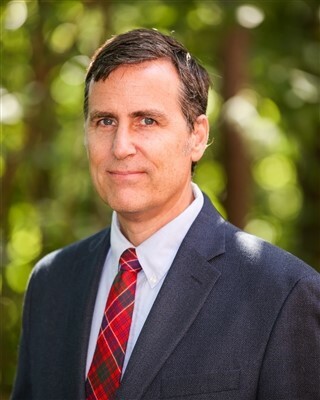 Steven is a senior fellow at the American Principles Project, a grassroots movement founded by Princeton Law Professor Robert P. George to renew American culture, particularly through a recovery of authentic Catholic and classical education. He is a senior contributor to the Imaginative Conservative and writes for many other online Catholic journals, with over 150 articles published in the last four years. Steven was named by the Cardinal Newman Society as one out of about 30 pro-life Catholics calling on all Catholic colleges to be faithful to the Magisterium. He will be traveling to California this year to give a talk on the Catechetical Narratio at the Formation Summit and to New Hampshire to work on the 5th Sophia Institute curriculum guide, among other scheduled public appearances. Please join us in supporting his efforts by prayer and affirmation and he proceeds to represent Holy Spirit Prep throughout the country as he writes and speaks publicly on matters of faith, culture, and education. Featuring a cast principally composed of Upper School students. Write Mr. Scully at bscully@holyspiritprep.org for more information. It's probably too soon to call it a new Catholic rivalry, but varsity football turned up the heat against its first-ever game against Notre Dame Academy last Friday, August 25. The Cougars owned the field from the start, closing the first half with a 21-0 lead over the Fightin' Irish. They gave a way a touchdown and field goal in the 3rd quarter, but mopped up in the 4th with a final score of 55-10. Every in-town game begins with a tailgate starting at 5:00pm, with kickoff normally at 7:30pm. Bring your lawnchairs, appetite, and a few bucks for burgers, hot dogs, and chicken sandwiches. Julia Del Bosque won 2nd place and Camila Del Bosque won 4th for the girls varsity race. Andrew Churchill won 3rd place for the boys varsity, breaking his personal record by 40 seconds. The boys team won 7th place overall. Cross country's next meet takes them to Rome for the Berry College Invitational this Saturday, September 2. In anticipation of the Labor Day weekend, the Preschool will dismiss early this Friday, September 1. Dismissal is at 12:00pm. There will be no after-school care or activities. The Lower and Upper Schools dismiss at 12:30pm. Get ready to bring your parents to school! Bring Your Dad to School Day is Wednesday, September 6 (Thursday, September 7 for Pre-K2s). Bring Your Mom to School Day is Wednesday, September 13 (Thursday, September 14 for Pre-K2s). You'll get share a snack and some craft time in your classroom until about 9:30am with mom, dad, or any special friend you'd like to bring. In anticipation of the Labor Day weekend, school will dismiss early this Friday, September 1. Dismissal is at the Lower and Upper Schhools is at 12:30pm. There will be no after-school care or activities. The Preschool dismisses at 12:00pm. Mr. Schultz will host a series of coffees by grade, and would love for you to join him. These coffees are an opportunity for Mr. Schultz to meet with parents, share updates of the school, and hear parent feedback. If you'd like, you can join Mr. Schultz for Mass at 8:15am with your student's class, then enjoy some coffee and conversation in the media center starting around 9:00am. Jordan Daly, a senior at the Upper School, is earning her Girl Scout Gold Award. Her project, named “beYOUtiful,” is a class for girls ages 8 and up about self-esteem, hygiene, and bullying. Jordan will provide the girls with packets and handouts about these subjects so that in the future they know what to do in certain situations. Jordan's class features two speakers, a guidance counselor who will speak about bullying, and a nurse who will talk about hygiene. The class will be Sunday, September 10, after the 11:30am mass in McDonough Hall. The class will last for about an hour and a half (12:00pm-1:30pm) and snacks are included. You can sign up your daughter by emailing Jordan at beyoutifulgoldaward@gmail.com. Holy Spirit Prep has a history of successful Girl Scout Troops, starting in Kindergarten. Since 2014, HSP has had fourteen Girl Scouts earn their Gold Award, the highest award available to Girl Scouts (equivalent to Eagle Scout). This is an incredible accomplishment which has been reported by local newspapers. These fourteen girls have been Head Girls, House Presidents, soccer, basketball, volleyball, and cross country team members, cheerleaders and members of the Chorus. If you have a daughter at the Lower School who is interested in joining Girl Scouts, please contact Kelly Angelo (kangelo@coca-cola.com) or Dede Casal (adolphcasal@comcast.net) for more information. We are inviting families to send in fresh flowers at the beginning of each week for the Lower Chapel during the 2017-18 school year. During Lent, we ask that you send in a simple plant. The flowers add to the beauty of the liturgy and offer a way for you to honor a special person or date in your lives. You may commit to one or more than one week. The flowers should be sent in on Monday morning or if Monday is a holiday, the first day of that week. A vase is provided in the chapel for flowers. Thank you for your beautiful addition to our LS chapel. It's football season, and we are in need of student volunteers to assist with the concessions stand at our home games! Come out to support our Cougars and serve your peers--and earn a few service hours! 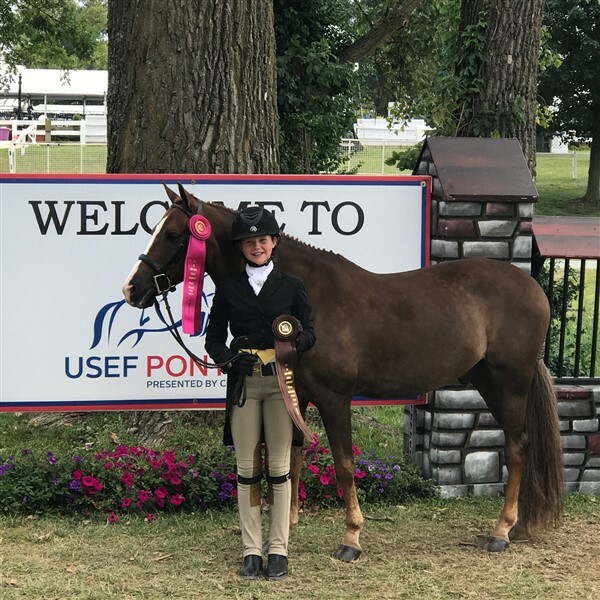 Congratulations to 8th-grader Ella Duffy, who competed at the United States Equestrian Federation's Pony Finals National Championship this August in Lexington, Kentucky. Ella competed in the Medium Pony division against 160 ponies from across the U.S. and finished 8th Overall! Her hard work and dedication has clearly paid off, and we are proud of her accomplishment. Holy Spirit Prep has a history of successful Girl Scout Troops, starting in Kindergarten. Since 2014, HSP has had fourteen Girl Scouts earn their Gold Award, the highest award available to Girl Scouts (equivalent to Eagle Scout). This is an incredible accomplishment which has been reported by local newspapers. These fourteen girls have been Head Girls, House Presidents, soccer, basketball, volleyball, and cross country team members, cheerleaders and members of the Chorus. They are all successfully pursuing degrees at the universities of their choice. Girl Scouts not only offers leadership skills, but also provides girls with opportunities to gain new skills and potentially travel. If you have a daughter in 7th, 8th, or 9th grade who is interested in becoming a Girl Scout, it is not too late! Please contact Kelly Angelo at kangelo@coca-cola.com for more information or with any questions. If there is enough interest, we will schedule a troop organizing meeting for parents and their daughters. We are reaching out to the Moms from our Catholic School communities, inviting them to join us in our next study of God's Word. If you are receiving this, our hope is that you can share this invitation with the Mom's at the school or can forward it to someone who can. Thanking you in advance for helping us in our ministry to Proclaim His Word! Matthew's gospel begins with the birth of Jesus Christ; when God Himself came in the flesh to save and redeem us. It has been called, the “teaching gospel” because it includes more practical teachings of Jesus than any other gospel. We will find guidance here that will help us live faithfully in a world that either denies the existence of God or wants to re-make Him in man's image, just as the Pharisees tried to do. Jesus makes it clear that the inner motives of the heart and mind are much more important than following man-made rules and opinions. As we study His teachings and parables we will learn how to better apply them to our lives today. Please join us as we open our ears and hearts to receive His teachings, allowing them to deepen our personal relationship with Jesus; where “God in the Flesh” reveals Himself through the Gospel of Matthew. Holy Spirit is pleased to welcome the relics of St. Pius of Pietrelcina (Padre Pio) on Tuesday, October 3rd. We will be the only parish in the Archdiocese hosting the relics and are expecting a tremendous crowd - potentially exceeding the number of pilgrims that came when we hosted the relics of St. Maria Goretti. Please consider giving your time and talent to assist. The volunteer opportunities are listed on this Sign Up Genius page. If you have any questions, contact Kim Schulman at 404-353-4513. To learn more about the St. Pio's relics at Holy Spirit, please visit: www.hsccatl.com/stpio. Join Fr. Juan for a father-son campout!